Posted on February 9, 2017 by Billy S.
Sending multiple emails with every form response is one of our strongest features that virtually every form uses. Addressing the email messages is done by either manually entering email addresses or by using one of the Email Address items in your form. The Email Routing items are powerful tools that not many know about and they can help you make more efficient and useful notifications. The standard Email Address item is common and easy to understand, but what about the other available items? The Email Address item is a special Short Answer type that tells the form that you’re expecting an email address. The formatting is validated automatically to help reduce incorrect values, and the option to show a confirmation box is also available. To send an email notification using an entered email address, you must use the Email Address item to collect the email address. Using a Short Answer item or any other text item will not be able to use the entered value as the email To: address. 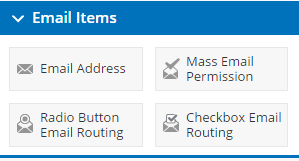 The final items in the Email items area are the Radio Button Email Routing and Checkbox Email Routing items. 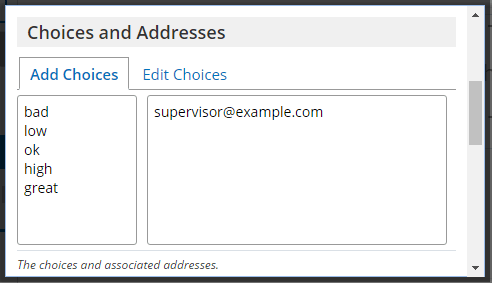 These items allow the form designer to assign email addresses to choices on the form, then create notifications with those addresses as the destination. Note that the Radio Button Email Routing item is used to limit the message to only 1 of the available choices. If the ability to send to more than 1 is needed, the Checkbox Email Routing item would be used. After the item is created, the form builder goes to the Form Settings -> Notifications page and sets the notification with the routing item as the To: address. Example 2: This evaluation form has scales for the visitor to report their experiences and the form owner wants to alert the departments when very low reports are made. The email routing item is used to collect the responses and the appropriate addresses are added to the lowest values. 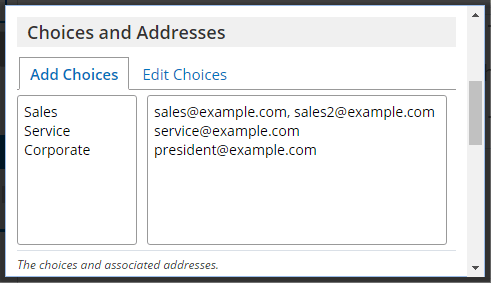 The other values are left blank to indicate no emails should be sent.